So the company who built and installed my garden building have done their bit. 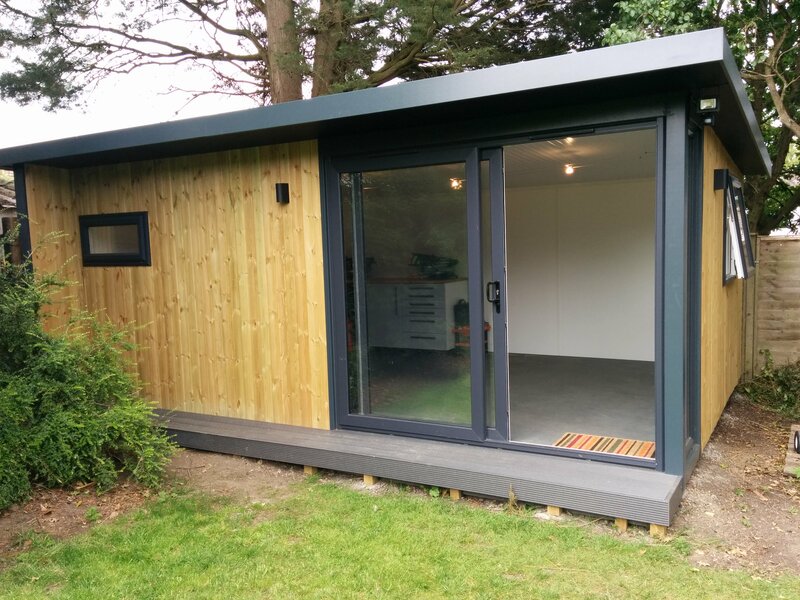 Now it’s time for me to turn a lovely garden office into a proper workshop / man cave. The included options of wood flooring or carpet tiles didn’t really suit me. I decided on a single piece of grey vinyl flooring from Factory Flooring Direct. I wanted something fairly hard wearing that could stand up to the abuse of a workshop and cope with any spills. The ply that the installers put down was a rather pointless 6mm, so that was ripped up and a sturdy 18mm ply base put down. My brother gave me a hand cutting the vinyl to fit as it wasn’t an easy job – especially with my attention for detail and the fact that I didn’t want skirting board to hide any gaps. It was hard for a number of reasons. Firstly, the roll was too heavy for one person to lift. Secondly, as it was one piece it was bigger than the room and hence hard to manhandle. We did it though. I now had a nice tough grey vinyl floor. Next was the workbench and shelving underneath. Being spoiled for space somehow made it harder to work out what I wanted and how I would lay it out. I settled on using some solid beech Hammarp kitchen worktop from Ikea. I intended to use oak but when I actually saw it the beech looked better and was cheaper too. 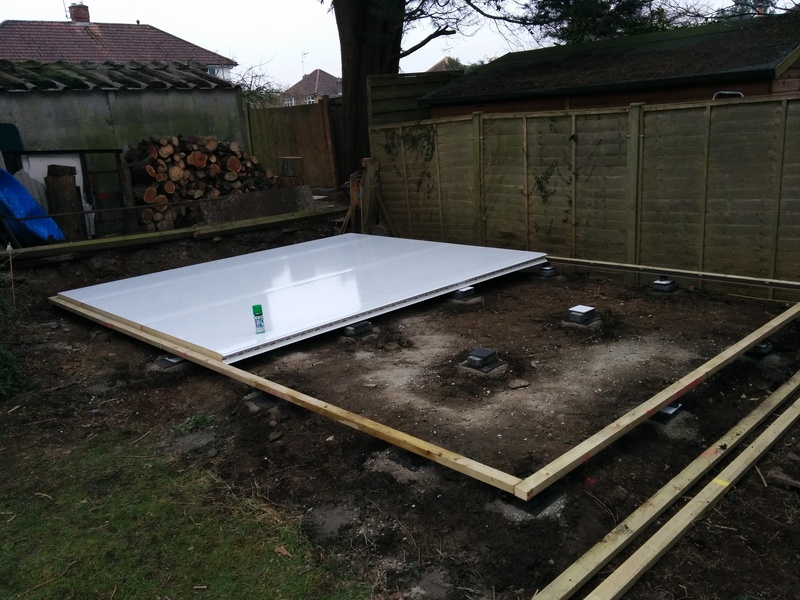 The walls only really have decent support at the joins between the prefabricated panels so I used some steel angle iron along the walls and 30mm stainless steel legs to support it. All the metal is from Metals4U. The desk drawers are Ikea Alex and the kitchen units Ikea Metod / Maximera. Basically – it’s mostly an Ikea kitchen! 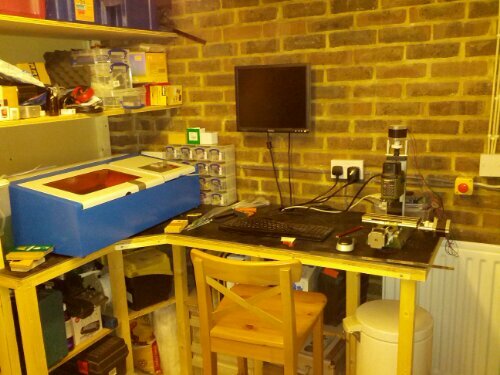 That gives me some desk height (73cm) and mostly workbench height (93cm) space. All of this was meticulously fitted to the not-quite-straight walls so there was no gap. I borrowed a kitchen worktop jig to mitre and biscuit joint the worktop. Lots of work but worth it to get a good fit in the end. The under-bench shelves are just melamine panels – some 30cm and some 45cm deep. You may notice there are lots of sockets. You can never have enough sockets. There are 11 double sockets – some above and some below the worktop. There will also be one on the outside for garden power (hedge trimmer, etc.). The ones by the desk are always powered, but I carried over an idea from my previous workshop. The ones at the workbench can be isolated using an emergency stop button. It’s not just used as an emergency stop. I mainly to make sure that if the kids wander inside all the dangerous stuff and power tools can’t be switched on. I trigger it as I leave. The kid’s workbench. They want to be like their dad! The keen-eyed will have spotted 2 fire extinguishers (powder and CO2). I’ll be burning things with a laser in a primarily wooden building so a sensible precaution. 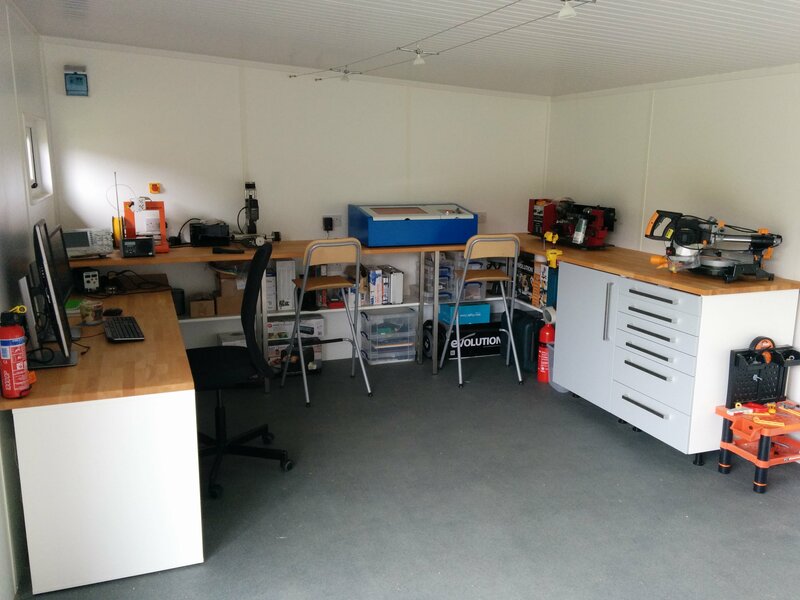 All this stuff only really takes up half of the workshop – the mostly hidden half. The right hand side should soon be getting a sofa bed (for the occasional brave visitor), fridge, etc. It’ll be a family space and my wife will have her input. However, I have said that if a scatter cushion appears it’ll have an accident with the mitre saw. There’s still workshop stuff to do. 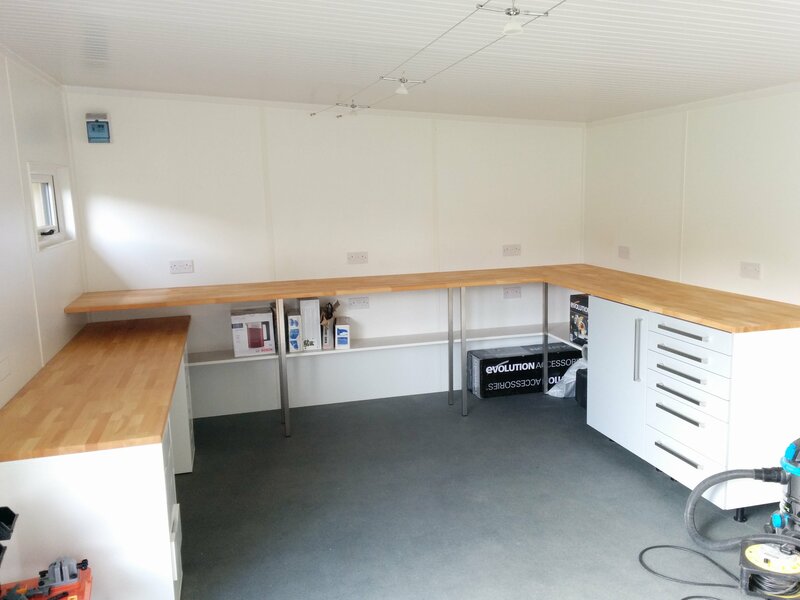 There’s plenty of storage space under the bench but shelves and wall-mounted tool boards are coming soon. The laser isn’t usable yet as it has no exhaust venting. I’m also planning to put a sink in there to allow making a cup of tea and washing hands. It’ll drain onto the ground rather than have any plumbing back into the drains so it’ll be fairly limited. I’ll let the rest evolve as needed. Maybe it’ll never happen but the plumbing is there. My current workspace at the back of the garage seemed like luxury at the time. Rather than just squeezing everything onto a small piece of kitchen counter next to a sink, I made a custom L-shaped workbench that was built like a tank. It had shelves below, some above and plenty of power points. Unfortunately I soon filled the space with a laser cutter that was bigger than I expected. Then the old space beside the sink became occupied with a lathe. It’s true that stuff grows to fit the space you have. Since we moved into our house 7 years ago, there has been a bit of ground at the bottom of the garden under the shade of some old plum trees. Only brambles grew there along with builders’ rubble and a small shed. It was fenced off and more or less abandoned. The time eventually came to do something about it. The full space was 9m x 4.5m. Trees and a fence were removed. Earth was shifted and the ground was flattened – very hard work. About two thirds of this space was about to become a new workshop, with the remaining third for the kids to have a swing, slide or something. I shopped around for a while. Dunster House looked OK, but had enough bad reviews online that they were discounted. Then I found The Garden Office. A bit more expensive but much better. They’re a really great company who I can highly recommend. I went for a building with internal dimensions of 5.5m x 3.8m – about the largest I could go and still leave a reasonable space for the kids. I was very impressed when visiting their showroom. Unfortunately they’re now so popular they had a 3-4 month lead time. 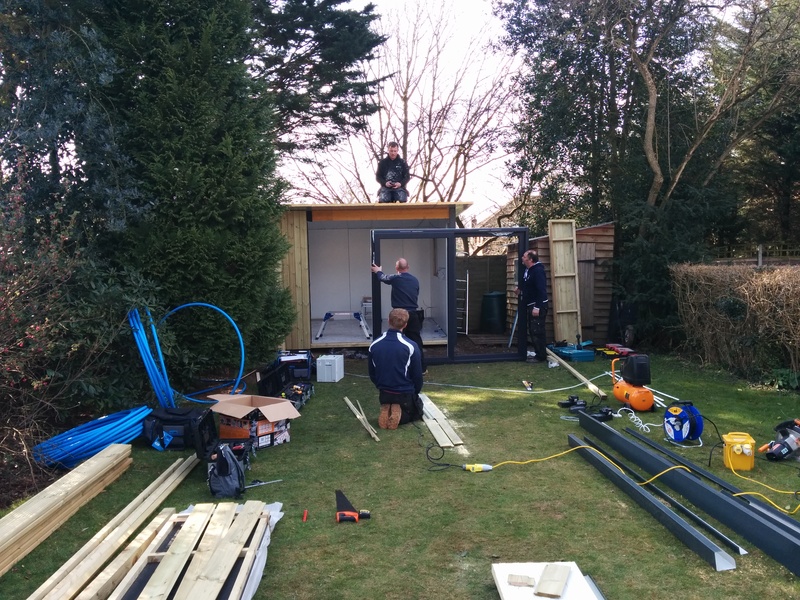 Then on the Monday to Wednesday of the next week the rest of the build went ahead. Once again, a really great team who seemed genuinely keen on providing what I wanted rather than just getting the job done. I knew I wanted lost of power points but I had no idea where. They were happy to run extra cabling where I thought I might want them and to leave some panels loose for me to get in there and wire it all up. They also left the flooring unfitted at my request so I could fit a thicker plywood base and a custom vinyl floor. The only minor glitch came with the laying of the armoured power cable to my new workshop. Rather than waiting for an electrician to sign it off, the build team buried the cable themselves (along with some CAT6 and water pipe). There was a bit of hand dug trench they didn’t back fill, and the depth of the cable here didn’t look right. I dug a few test holes and found it hadn’t been bured to a safe depth – despite the trench being dug deep enough. Maybe they didn’t think anyone would be picky enough to dig and check! Anyway, it was remedied quickly and without any quibbling by the Garden Office team. I always say you can tell more about a company by how they handle the odd mistake then if they make no mistakes at all. Once again they did well. 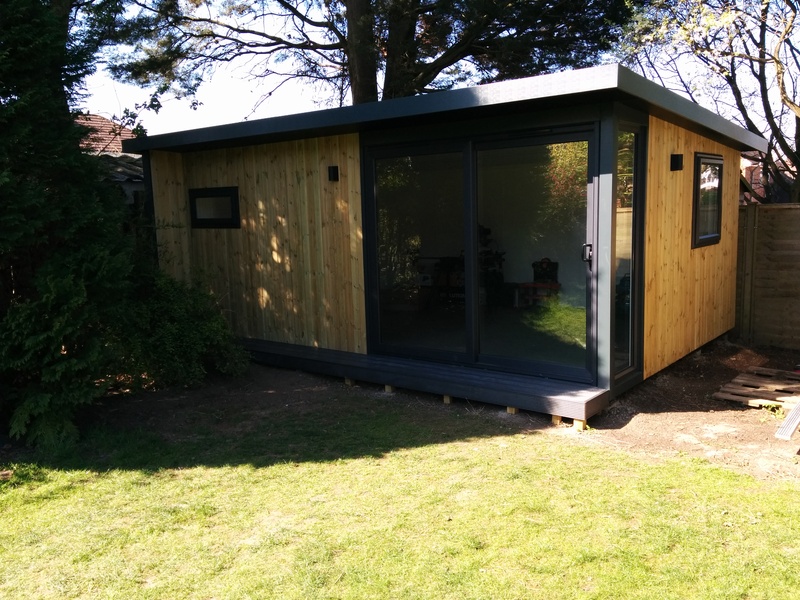 If you’re after any sort of garden building I have no hesitation recommending The Garden Office or their sister company Green Retreats.